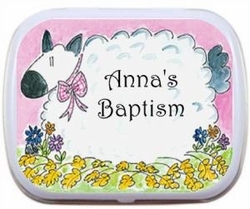 Our Personalized Mint Tins are a fun and tasty way for your guests to remember your baby's Christening or Baptism celebration! Personalized mint tins are a trendy favor to give this season. Our designs are current and fun along with a few classics. We will fill each tin with your choice of candy. Choose from peppermints, cinnamint or sweet tarts. Each personalized mint tin is individually shrink wrapped and includes mints or candy of your choice from our selection. Should you have any special requests regarding the layout or wording of the tins, please let us know. We will do our best to accommodate all requests. Keep in mind that colors on the screen may not match the colors on your screen so there may be slight variations on the printed product.